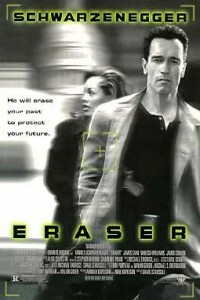 There is an old Arnold Schwarzenegger movie entitled, “Eraser.” His job was to “erase” a woman who was running from the bad guys; erase her so they couldn’t find her. He erased her by deleting everything in the system about her – her driver’s license, birth certificate, records of any sort. He also took everything away from her that represented her old life, things like credit cards, jewelry, and pictures. She wanted to keep a necklace she wore all the time. He told her she could keep nothing from her old life – she had to be erased. He gave her new documents and credit cards, then he moved her to a safe location to start a new life. She was erased – as if she never existed in her old life. Her job was to be so aware of her new life that she quit being aware of her old life. She was to quit doing the things she used to do. She was to completely forget her old life things, her old life ways, her old life, period. She was to develop a new-life consciousness – to be aware she had a new life and her old life was gone. That movie reminds me of Christians. We are supposed to know we have been erased from our sin consciousness when we made Jesus Lord of our life. Through the Word of God, we are supposed to be so aware of our new life that we quit being aware of our old life. We are to quit doing the things we used to do. We are supposed to completely forget our old life things, our old life ways, our old life, period. Yet many Christians are still sin- and old-life conscious. They only focus on mistakes they’ve made. In the Old Testament, under the Levitical law, an animal had to be offered every year to atone for the sins of the people. That Old Testament word, atone, means “to cover.” It is used all throughout the Old Testament. This is NOT what Jesus did. Sounds like an eraser to me! Have you ever lain awake at night with all your problems running through your mind to the point you can’t sleep? Have you ever felt so badly about something you did that you were ashamed to get before God because you felt unworthy? If so, you are sin-conscious. Have you ever repented of a sin then have the memory of the sin come back and haunt you over and over and over in your mind until you just feel there is no way God could have forgiven you of that sin? If so, you are sin-conscious. Jesus WILL erase your past. He WILL protect your future. Being sin-conscious will destroy your present and your future. You need to learn to focus on the fact that God Almighty says when you repented, He immediately forgets that sin (Hebrews 10:17). He remembers it NO MORE. God is saying your past is forgotten – erased. It is as if you never committed that sin – you are clean, pure and have a fresh slate. When God looks at you, He sees you free from sin, as if your old life never existed. Righteousness = innocence. You are innocent. Instead of thinking about everything you did wrong, think about everything Jesus did right. Think about and focus on the fact that all your sins have been completely wiped out. Erased. Erased – never to be seen or thought of again by God. If God forgets it, don’t you think you’d better forget it, too? That is awesome. A new life, another opportunity to live free of the past and have a future that is filled with the good things of life. But it really is difficult sometimes to forgive your own self and just LET THE PAST GO! I’m glad He erased my past. Perfect timing! I love this movie and how you applied it biblically to us. So much truth, and still we keep bringing up our sins. I will walk in complete forgiveness, today. Knowing that ALL my sins have been ERASED!